A wedding in Umbria is a great idea for the couple who loves quiet and intimate settings. In Umbria the venues are charming, there are beautiful historical masterpieces and there are not too many tourists. Often called the country’s green heart, Umbria is known for its medieval hill towns, dense forests and local cuisine, particularly foraged black truffles and delicious wines. Umbria is the birthplace of saints and warriors, and also is one of the most mysterious and fascinating Italian regions, not far from Rome. Hilltop Perugia, the regional capital, is the site of medieval Palazzo dei Priori, housing the Galleria Nazionale dell’Umbria art museum. Perugia is also known for its defensive high walls and for the beauty of the historical center. 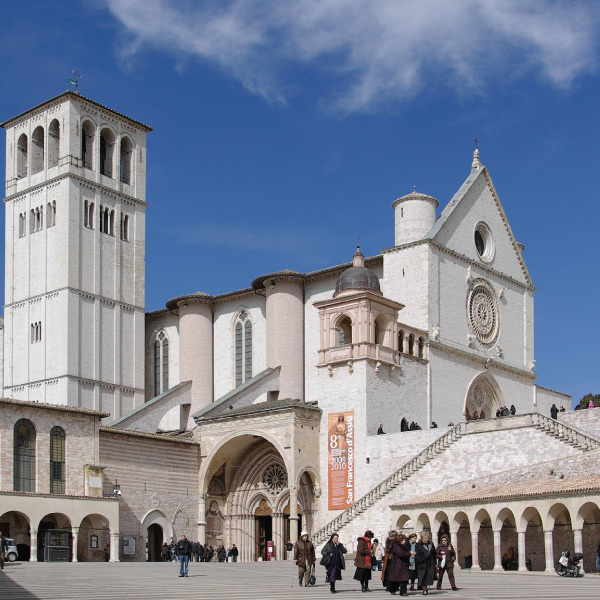 It is not important whether your wedding in Umbria will be religious or not, Assisi is a beautiful city to visit. Furthermore, its legacy will leave you mesmerized and at peace. The medieval and pink-stoned Assisi, snuggled enticingly on the slopes of Monte Subasio, would be a delight even without the considerable legacy of St Francis, who was born here in 1181. His burial place, the immense Basilica di San Francesco, is filled with innovative and beautiful frescoes by Giotto, Cimabue, Simone Martini and others. If you wish your wedding in Umbria to be intimate and spiritual, I believe that there is no better place than Umbria. You will be far from the big cities’ glamour but closer to the spirit of beauty and nature. In the area around Assisi, several villas and country houses, open their doors for events and weddings. I personally love the rustic and authentic flair of these locations which are less refined than the ones in Tuscany but are equally charming and beautiful. In Umbria, there are dozens of small, medieval villages castled over hilltops and cliffs. All of them are charming and have a genius loci that will make a difference for your Wedding in Italy. The Umbrian cities are easy to reach with a car and are great day trips if you are renting a villa and are planning some outdoor activities. I particularly like Orvieto because it is slightly detached from the rest of Umbria, but its position on the main railway and motorway between Rome and Florence makes it easy to visit. Even if you are on a train or in a car intending to pass it by, the sight of the town from below, perched spectacularly on an immense ancient volcanic outcrop, it is guaranteed you will feel like making a stop. Norcia is also on the top of my personal Umbria’s favorites list. Norcia is the hometown of St. Benedict and is the “wildest” of the Umbrian cities. Come in late May or early June to see the celebrated wildflowers that cover the Piano Grande, a vast upland plain above the town. Plan to do so some hiking at the same time on the vast, smooth-flanked Sibillini Mountains National Park that rise on all sides. I will be happy to assist you in planning your trekking on the Sibillini mountains with a professional guide and with a rich dinner waiting for you at home. Your wedding in Umbria can be the best day of your life and also a wonderful holiday with your family and friends.